We are familiar with claims that air pollution (cue pictures of diesel cars!) is killing thousands of people every year in the UK. I have been trying to get hold of the actual mortality statistics, but fortunately came across a study carried out by the British Lung Foundation. Finished last year, it analyses death rates between 2008 and 2012. Over half of the deaths from lung disease in the UK are due to lung cancer and COPD . Both conditions are strongly linked to tobacco smoking, which is also a risk factor for pneumonia, another leading cause of death. Taking lung cancer and COPD out of the equation, we are left with 49030 deaths from other causes. Of these pneumonia accounts for 28952, and as the Report states, smoking is also a risk factor for that. Pneumonia is not caused directly by air pollution, and is usually a viral infection. Some groups have an increased risk of developing pneumonia, including smokers, people with other health conditions, and those with a weakened immune system, for example following a bout of flu. What is clear is that there is very little evidence to claim that some cases of pneumonia are caused by air pollution. Most of the other causes can be rules out for any connection with air pollution, including lung diseases due to external agents (usually coal dust, asbestos, silicon dust etc), pleural mesothelioma,pulmonary embolism, bronchiectasis, pulmonary vascular diseases, TB, sarcoidosis,perinatal conditions, cystic fibrosis, and influenza. Asthma is caused by inflammation (swelling) of the breathing tubes that carry air in and out of the lungs. This inflammation makes the breathing tubes highly sensitive, so they temporarily become narrow. This may occur randomly, or after exposure to a trigger. The tubes may also sometimes become clogged with sticky mucus. The reason why some people develop asthma isn’t fully understood, although it’s known that you’re more likely to develop it if you have a close relative with the condition. Clearly we don’t know everything about asthma, but there is little evidence to suggest that air pollution from traffic makes much difference. The other two causes on the list are, of course, merely catch alls. Smoking is the main cause of COPD and is thought to be responsible for around 9 in every 10 cases. Exposure to certain types of dust and chemicals at work may damage the lungs and increase your risk of COPD. But at the moment the link between air pollution and COPD isn’t conclusive and research is continuing. Smoking cigarettes is the single biggest risk factor for lung cancer. It’s responsible for more than 85% of all cases. If you don’t smoke, frequent exposure to other people’s tobacco smoke (passive smoking) can increase your risk of developing lung cancer. Exposure to certain chemicals and substances used in several occupations and industries has been linked to a slightly higher risk of developing lung cancer. While some studies link diesel fumes to lung cancer, the actual numbers indicate that if there is any effect it is a very small one. There were 35419 deaths from lung cancer in 2012, Even if a small proportion of these were linked to air pollution, the total number of deaths, including the other respiratory diseases, would be much smaller than the 40000 estimated. It has also been claimed that air pollution can exacerbate heart conditions, but with so many factors contributing to heart disease, any attempt to claim that a certain number are due to air pollution is dishonest. The claim that 40000 deaths are linked to air pollution is not supported by the facts, or for that matter any figure close to it. The vast majority of deaths from lung disease, 88%, are in the over-65 group. Indeed most of these are actually over 75s. It is a sad fact that we all have to die of something. And when medicine has kept us alive into our 70s and 80s, it is often our respiratory systems that pack up first. There does not have to be an external reason for it. In fact, in some ways, we could argue that these are not “premature deaths” at all, but that people have lived longer than “normal”. But more importantly, older people will have been exposed to all sorts of air pollution, both indoors and outdoors, throughout their lives. 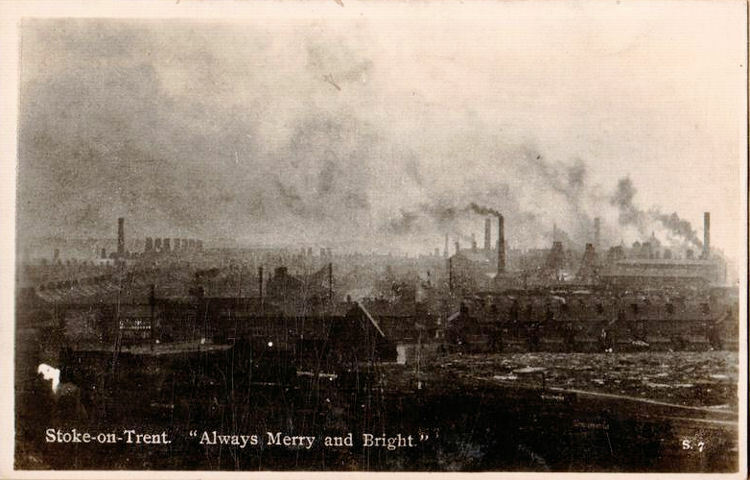 Most of this pollution must have been many times greater and toxic than anything people are experiencing nowadays. So, even if there really are 40,000 premature deaths a year, they have occurred because of the cumulative effect of inhaling real pollution for decades, and not as a result of current levels of pollution. The Lung Foundation show this chart for the relative risk of dying. (The scale is from 0.6 to 1.9, so there is roughly three times the risk of death in the worst areas than the best. As would be expected, the risk is much greater (dark areas) in the industrial heartlands of the North West, Yorkshire, Tyneside and Scotland. In contrast, London barely figures at all. Although the BBC version is only for PMs, there is no correlation at all with the actual death statistics. According to it, about 8% of adult deaths in London are due to PMs alone, never mind other pollutants. If this figure was applied nationally, it would imply a total death from PMs of 45,000, more than a third of the total deaths from all types of lung disease. We have already seen that the vast majority of deaths from lung disease are related to smoking. Quite simply, the numbers simply don’t stack up. The RCP report did not undertake any research of its own, nor commission any. Instead it has merely taken evidence from previous studies. There are many junk studies from which they could have cherry picked any answers they wanted. The whole report is clearly written around a political agenda, with very few hard facts presented. (To get a feel for this, check out the 20-page summary, full of silly cartoons and scary headlines). The original objective was to investigate the health effects of climate change. Realising this was likely to be a dead duck, what better than to raise the spectre of air pollution? Of course it’s nonsense as was obvious without these figures. But how can we convince our gullible politicians who seem unable to resist signing up to any green scare story? This should go straight to the Minister responsible for promoting this the proposed 2040 ban-apart from which, electric cars are nonsense on stilts in so many ways. What is interesting is that the doctors do not recognize the impacts of pollution, but the people that want to control pollution have. Defra has a tool to display maps of (modelled) air pollutants. I looked it up a few weeks ago in response to the nonsense about banning cars with engines – and even knowing it was there it took me a while to find it. Using the tool you can display the levels of all pollutants for a range of years: for NO2 this runs from 2001 to 2015. It is striking to see the decline over this period. For PM2.5 the decline is not as noticeable, but it’s there. For reference the link is here if I’ve typed in the tags properly. Thanks for the link. As you say several of the pollutants show a distinct reduction. More agitprop from the usual suspects amplified by the dear old BBC. You wont see much of a drop in PM2.5 because vehicles, and in particular diesel engines are not the major contributor. They just get the blame because they are an easy target and can be easily measured. But its like an open ended cheque book for the regulators and politian’s, one that will go on giving. If by any chance they manage their ban on the internal combustion engineer it will be a shock to them to se leaves remaining where they are. That’s the beauty with chose fake pollutants. They don’t go away. household sector emerged as the most important source of PM2.5 and PM10, with 52 per cent and 41 per cent, respectively. Domestic fuel use in the residential category ‘1 A 4 b i — Residential: Stationary plants’ is the most important key category for PM2.5 emissions, making up 45 per cent of total PM2.5 emissions. Sounds like typical fake news from BBC. Nothing unusual. Their so called journalists are as bad as the newspaper journalists, if you can call them that. I would say they are worse since they are bound by charter to be impartial and work for an organization funded by a tax that can result in a criminal record if not paid. Newspapers are free to take a political position and people are free to take it or leave it. In the US, air pollution levels fell substantially over the last 40 years while asthma cases rose. The correlation does not seem to hold. Oddly enough, working on a farm seems to correlate with very low incidence of asthma. The benefit of consuming that ‘peck of dirt’. GMTA! I ALWAYS question death statistics, indeed all statistics. Most are farts out the a$$ to try and get money or further control something. And when do you sleep, Paul? A story like this takes hours to put together and verify. Heck, just writing this comment took nearly a half-hour. And keep a VERY SHARP eye out with those number for deaths under 65. 2,400 for under 14, and 88,000 for 15 – 64 are NOT very large numbers when you “annualize” them. That is less than 8 children a day dying. Yes, every young death is tragic, but using fake numbers to extract money from someone is unethical. Whenever you hear a number per something, annualize it. You’ll find it is either TOO big or nearly insignificant in comparison. 1 Billion over 10 years is only 100 Million a year. Compared to whatever number in the UK economy that is usually a small fraction of ONE percent. In my WordPress app, there was a link to “Air pollution killing 14,300 Kenyans annually: report.” https://respromasks.com/2017/03/10/air-pollution-killing-14300-kenyans-annually-report/ Is it OK to say that I have even less confidence that that number is accurate? You will often see “in the world” numbers. I have ZERO confidence in such numbers. No one has even a clue about “worldwide” statistics. Even the population numbers are little more than an educated guess. How do you have any confidence in numbers produced by failed governments or NGOs whose funding depends on problems existing? Well, I was going to end with a quote like “statistics don’t lie, but liars use statistics” but in my quest for accuracy I found that that may never have been said. It is true never the less. So hang on to your wallets because someone wants your money and they WILL use questionable statistics to get it if you let them. Excellent analysis Paul, as always. A few days back WUWT carried a long article which examined the background to the RCP report which is now causing so much fuss. It includes this interesting nugget of information: “The chair of the RCP’s working group, Stephen Holgate of Southampton University, was also on the panel that produced the COMEAP report back in 2009.” According to the article, the COMEAP report convened this panel of 7 experts to assess risk factors. Their inputs were then pooled. I will paste that section of the article below. Overall it does appear that the whole thing is based on some pretty vague work which has since been “refined” a few times! More generally, the govt’s own data show that levels of the key atmospheric pollutants have fallen dramatically across the country since the 70s. “Hotspots” in some cities are the exception. Lastly, if diesel pollution has such a dramatic effect, there should be strong evidence from major cities in France and other countries. They went diesel big-time back in the 70s and 80s when the cars were far more polluting. Logically they should be reporting far worse figures but we are not hearing anything. Strange. “The first UK specific report on the matter was produced in 2009 by COMEAP . Broadly, they agreed that the approach used in the 2002 US study was applicable in the UK too. They set out to estimate the value of the “risk coefficient” which should be used. (The risk coefficient is the percentage chance of death from a pollutant for a given unit of change of concentration. In this case, the unit of concentration was 10 micrograms per cubic metre). They agreed that the risk coefficient suggested by the US study, 6 per cent (also sometimes stated as a “relative risk” of 1.06) would also be appropriate as the best estimate of the risk in the UK. Superb analysis Paul, thank you so much for the clarity. Oh dear, how embarrassing. Yet another entirely contrived ‘climate change’ claim completely, 100% busted. Bravo, great work. This presentation is worth a look. It basically rubbishes meta-analysis on a statistical basis. It seems that the BBC is a major contributor to airwave pollution which can have serious effects on intellect; but little research has been done on this. What about the effect on blood pressure? I’ve given up BBC for health reasons. Paul, basically you have confirmed what WUWT have said and the study done by Steve Milloy of Junk Science fame. He Studied over 2 million deaths in California from 2000-2012 and got the study published. Absolutely no correlation between pm 2.5 and those deaths. He also has other peoples studies showing similar results. 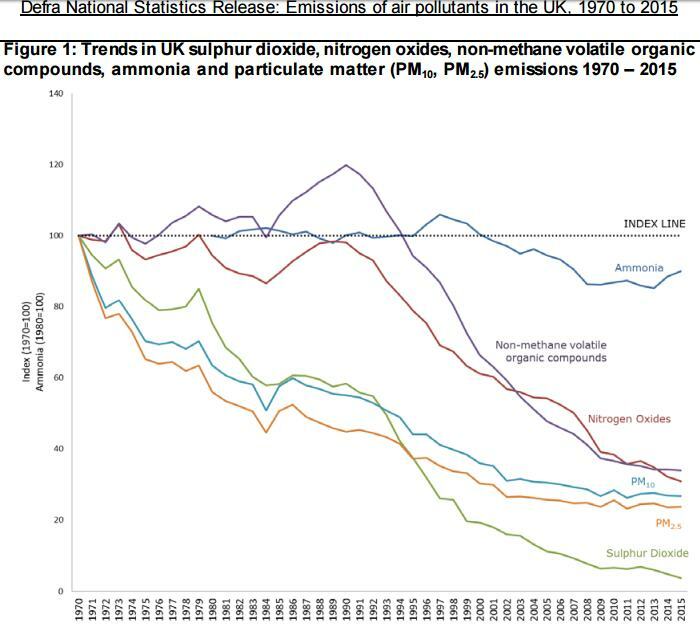 Our own UK Government Statistics show that there should have been 100s of thousands of deaths in the 1960s & 70s due to pollution as the current levels are between 60% to 90% lowere than in those decades. Steve Milloy forced EPA to agree that there was no effect. The alternative for them was ‘major jail time’ for experimenting on people by getting them to breath fumes piped in from a diesel truck parked outside (alarming shades of the ‘Gaswagen’!). There were no measurable effects despite their efforts! More details on ‘junkscience’. And in Steve Milloy’s book, Scare Pollution. Great summary of current understanding of PM2.5. Effectively just more green BS to try to control our lives! Bioethics running second to biopolitics. With the BBC, once again, as useful idiots. What do you mean, “as would be expected”? You appear to be assuming that industrial air pollution is indeed responsible for higher mortality risk, contrary to your main message. When the US EPA was planning a study of air pollution in California, there was one county (Contra Costa) with high mortality from lung diseases. This county has major oil wells, oil storage tanks, and petrochemical production, so was feared, “as would be expected” to be impacted by this activity. When I went there to scout out locations for the study, I could see that there was little air pollution, while a few miles to the south, Los Angeles was visibly dirty. I therefore split the study in two and looked at both areas. In the results, L.A. indeed had about 3 times the particulate air pollution as in Contra Costa County. On further analysis, the increase in mortality in Contra Costa was linked to the higher rate of smoking there. (Smoking has a strong relation to blue-collar workers). The moral, supported by the rest of your article, is that you can’t relate mortality statistics to industrial air pollution without considering smoking as a main correlated parameter. You could add in diet, exercise, alcohol, housing conditions and a whole host of other factors. You only need to think back to what these areas were like 60 years ago to get an idea of the impact of real pollution then. My Grandfather and his father survived working in this. My Grandfather also survived Loos, Gommecourt and Baku but those are different stories. Paul, one thing that is never mentioned is damp and condensation induced Mold Spores, now there is a real health hazard. Excellent stuff! Well done Paul, filleted and cooked, chewed, devoured, processed and rejected. as usual careful, constructive analysis shines a light on the merchants of BS. And btw interesting and fascinating contributions on the thread particularly Mike Higton. What creases me though is that, despite all the evidence to the contrary ‘our’ government will not cease in it’s ignoble efforts to advocate, propagandize and use plain old lies to bamboozle, browbeat and keep cowed an ignorant population and a populus rather unfortunately not given at all to reading and researching the truth, seek the reality behind ‘government myth making’ ie real stories – individually and that’s the real sadness. Because, in that the truth is just kicked into the road side and left to wither. Plus and as I’ve said before this air pollution chimera is mixed in with the great carbon dioxide [a life giving gas incidentallyy]………… myth making but then back in the day diesel cars were the preferred option [<CO2!]. Antother day cometh, the current bogey men; NO, NO2 and……….. particulates – and far more dangerous are the hidden enemy but get a grip – it ain't about personal motor vehicular transport, more to do with HGVs/Trains/Buses and diesel types. Even if, the nation is forced dragged kicking and screaming into using lecky vehicles – somewhere in the world pollution is being manufactured to produce these expensive boondoggles – eco loons/virtue signallers never inform the UK public the full picture NOW do they!? – ref blog post – above. Stuff it and them all I say, get yourself large petrol/diesel 4×4 and reach out to happier, carefree times when people took responsibility and if necessary did the right thing – voluntarily irrespective of gubmint diktat. But as we all know, history is the recorder, if you tell it, ordain it, demand it – usually the opposite reaction is the result. They will fall off their high horses, pulled off more like, the only questions are the causal factors and when. Great article and analysis as usual. How do we get more better / more accurate reporting from the BBC? As pointed out in one post, it should be providing unbiased public information. Should we all complain? The problem with all these ‘statistics’ are they are just that. The causal link between smoking and COPD etc is just dreamed up through stats., as there is no way of telling, even by post-mortem, if a person has died due to smoking. Pollution levels in this country, including the so-called ‘bad ones’ such as PM10 and PM 2.5, have dropped rapidly since 1970. In short, everything that is ‘known’ about what causes respiratory problems/deaths is entirely down to speculation and conjecture. The only reason pollution is now being used as a tool to beat us with is that they have almost done the smoking-causes-everything absurdity to death and the ‘safe levels’ for pollutants keep getting shifted downwards as the levels drop. Cendoubleu must have his head in the sand regarding smoking and lung cancer/ COPD. Very few non smokers develop primary lung cancer or COPD and smoking is a major risk factor in CVD. Asthma is better diagnosed, perhaps over diagnosed now. Years ago it was simply wheezy bronchitis. Perhaps if he saw the lungs of a smoker and non smoker who both lived in the country he would change his mind. I have and know whose lungs I would rather have. I totally agree about seeing the lungs of smokers at Post Mortem time. I always remember being taught on a health physics course that smokers were less affected by other pollution by the layer of tar on their lung tissues, i.e. the extra deaths from air pollution was less for smokers. A bit of black humour, I suppose. How many of the supposed ‘premature deaths’ worked in notoriously unhealthy industries like coal mining or coal-powered trains? In the UK such places have mostly been closed down or cleaned up by health and safety regs, or at least should have been. CO2 is rapidly approaching its “sell by date” on the CW (Cry Wolf) scale; climate is getting boring because there are only so many times you can repeat the same mantra of “could” and “might” and “some indefinable time in the future but it will happen” without sending the sheeple to sleep; “biodiversity” and “sustainability” aren’t catchy enough and too hard to explain. I know: let’s try “air pollution”! Thanks for this article, Paul. It probably won’t have much effect but at least it gives us a chance to refute yet another piece of enviro-nonsense. As a child my son suffered from Asthma, and all I can ay is that his severest attacks were in May and and September. Not only that they were on roughly the same date, particularly the September ones. He was in the HDU on Cup Final weekend and the 18th (19th one leap year) for four consecutive years. The staff at the hospital always commented that there had been an upsurge in Asthma related admissions that week. I put it down to some sort of pollen in May and fungal spores in autumn. Probably a better area of researh that diesel fumes in this instance. My son was allergic to pollen for years. Not seriously, I’m glad to say, but May/June used to be a painful time from which we, and his doctor, concluded that it was genuine “hay” fever! Then some time in his 30s it just stopped without any apparent change in his life. We all tried to track down the reason since it might have been of benefit to others but we never did. The current scare about air pollution appears to have coincided with a minor (as I read it) return to smog conditions in London. I’ve suggested before that there hasn’t been any major change to London emissions over the last five years except for the advent of the latest must-have domestic accoutrement for the beautiful people — the wood burning stove. If the wood isn’t properly seasoned air pollution will follow as night follows foggy day! But we can’t point the finger at the Islington dinner-party set, can we? That would never do. We here in Washington State, if having a wood burning stove, now must have an approved unit that has a “Catalytic Combustor”** or some other manner of meeting strict output rules. Then, when high pressure or other conditions lead to rising pollution levels, bans are placed on all burning except for homes without any other type of unit. Some State funding is often provided to help with and encourage replacing old units with new, especially air sourced heat pumps. Propane is trucked to many rural homes and electricity is inexpensive. Our house is 100% electric — + plus the emergency wood stove. Further, wood is readily available — for us, just cutting and splitting. By the time you’ve cut and split the wood you’re probably warm enough! lots of wood burning going on in all London ‘burbs, it’s the growth of the make your garden, garage a house and charge rent – it’s a boom industry in the Sarf, especially along the Thames corridor Slough and west London – Hounslow, Hillingdon, Brent Staines/ Heathrow, Harrow etc. Perhaps a court case is in order to reverse the previous, absurd decision on car emissions being a lethal danger? Mike J; I was a hayfever sufferer forever until, about 3 years ago, it just stopped. This was probably coincidence but a friend had suggested eating honey, preferably local. The”theory” was that a regular, low dose of pollen would have an immunisation effect. Whatever the cause, I have hardly had a sniffle since. Of course, it could just as well be that I hit the manopause and it is true that I have been fighting the urge to buy a sports car!! cos in fact everyone dies a few days early due to lifetime effect air pollution unless an accident gets them first. – Almost zero people die of air pollution, so it’s not listed as cause of death on Death Certificates. or eg You might be dying of cancer, but you get another infection and air pollution might affect whether you recover or die from that infection etc. So Paul shouldn’t have gone looking for ACTUAL pollution deaths, cos despite what the BBC page said there are almost none . So Paul should have started with Spiegelhalters deconstruction. so 97% (or something ) of children walking to school are pretty safe. Of course, it is not just the BBC. yes they should have used the words theoretical equivalent deaths. Though at the beginning of the report they make it clear it’s not actual people but theoretical. As I said when all this brouhaha started, NO2 is the now CO2. This post adds usefully by delving into the medical data. Surely rational people who encounter the combined evidence must conclude that there is no real cause for alarm at all. yep look at Mearns aswell as Spiegelhalter..
With 40000 dead, they should have no problem giving us a few names.